An easy DIY project that encourages local pollinators to stay in the ‘hood. While I adore my honeybees, I also revere the amazing and often-times overlooked native pollinator, the Mason Orchard Bee (Osmia lignaria). Where the honeybee is a finely-tuned pollinating powerhouse with corporate efficiency, native pollinators tend to be the small-business counterpart, a mom-and-pop pollination operation, so to speak. The Mason Orchard Bee is self-employed jack of all trades while the honey bee is a specialist on the clock. Orchard bees are industrious little flyers who very rarely sting, and hit just about anything in bloom, and they do it early and often, and even in cold spring weather (unlike the honeybee). If you build it, they will come…and stay. Clean out and dry an empty aluminum can. I love Bush’s Baked Bean cans; the contents are delicious, and the can’s interior is coated with a nonreactive finish, but really any can will do. Turn it over so the bottom lid is on the top, and puncture it with a nail about an inch or two from the perimeter. 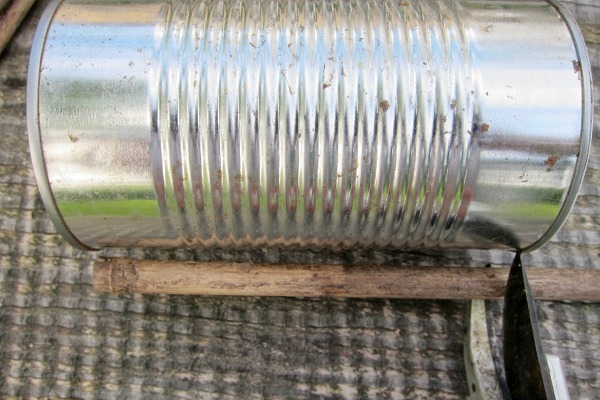 Turn it over again, and place a small wood screw from the inside of the can through the hole with a few half turns. 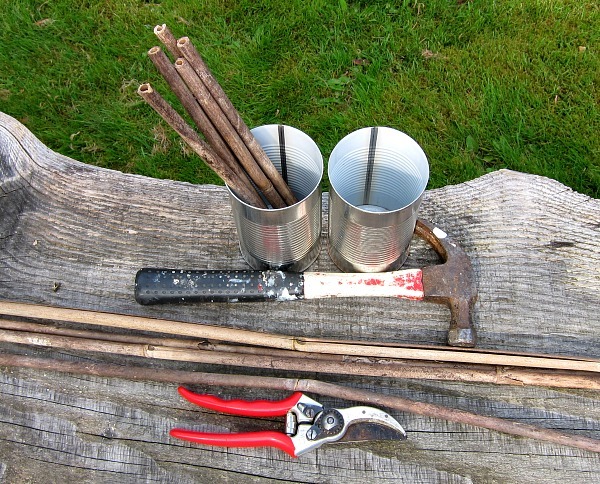 Cut hollow Bamboo sticks or reeds to a length about an inch shorter than the can. 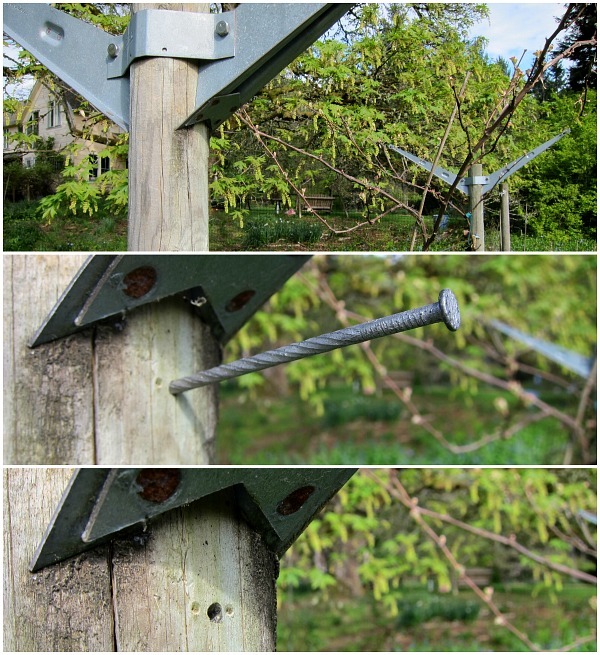 I placed my latest bee houses on my grape trellis posts, facing east away from the prevailing southwest winter storms and toward my early blooming orchard trees. Screw the can to the post or wall. Place the hollow sticks and/or reeds into the can. 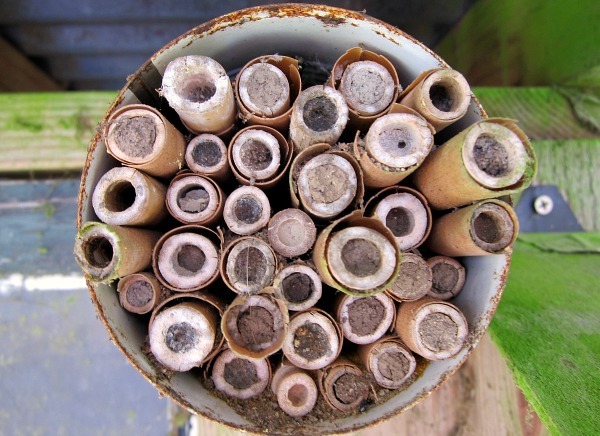 Since Orchard Mason Bees are only active a short time during spring and early summer, you may not see any capped egg cells in the tubes until the following year. Mason Orchard Bee eggs tucked until away next spring. I might not ever build one of these, but you sure make me want to do so! Nice job on the Mason bees. The number of filled tubes grows exponentially every year. They are happily and harmlessly buzzing around our deck and fruit trees. So true Gary, my earlier houses took awhile to find tenants, but once they did, a population boom for years to come. Can you please tell me where I can get reasonable priced reeds for Mason Bees? Where I live there expensive…. 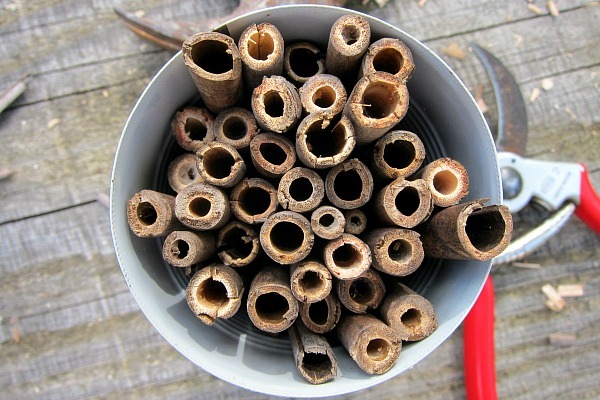 Douglas, you can make your own with brown paper bags, just cut the paper into smaller rectangles and wrap them around a pencil and tape to create your own mason bee tube or cut bamboo or if you want to buy them, these are pretty reasonable for 50 count. Thanks for your time to reply Tom. I may try the brown paper bags next year. All my reeds have been purchased from Crown Bee here in Washington State. I live in Olympia. I thought $15.00 plus shipping was a bit much for 50 mixed size reeds. I was hoping I could save some money and find my own but that’s not working out. Right now I’m using 4 home made blocks I drilled out, and 400 purchased reeds. The bees prefer the reeds 98% over the blocks. The blocks are made just like the ones you see everywhere. At the seasons end I can separate them to remove the cocoons as I do each year. Looking at your website I like what I see (good work here) and intend to keep you as a favorite. Thanks Douglas, and you know I’m with you, I hate spending money on the reeds when I don’t have to. Keep an eye out for wild stands of bamboo that are there for the cutting. I planted bamboo just for this reason, and it works like a charm. The bees are surprisingly adaptable to varying sizes of nesting entrance. Good Luck! Do you take the sealed of reeds out of the can in the winter? Here in California it is suggested that you remove the reeds after the bees are no longer active for the season and keep them in a cool location. They don’t like to be below 32 degrees, but storing in the refrigerator in a plastic bag is suggested. Karen, I just leave them in the can, here in the Pacific NW that works fine. I would keep them outside wherever they can stay dry, say like a garage or shed or chicken coop. I would think storing in the refrigerator would be problematic, too much moisture, causing fungus problems. The tubes and cocoons need to breathe, air circulation, so I’d keep them out of plastic bags. Hope this helps. Tom — Crown Bees has a over stock of mason bees. They go on sale the Saturday May 4th. You have to pick them up at their office in Woodinville. 13410 NE 177th Place, Woodinville. 100 cocoons for $10 They have of 75000 mason bees that need a home. I live in Seattle, so they send out an email to local subscribers. Thanks Steve, great tip! Most appreciated. Thanks for the great simple way to make bee homes. I will be doing this. 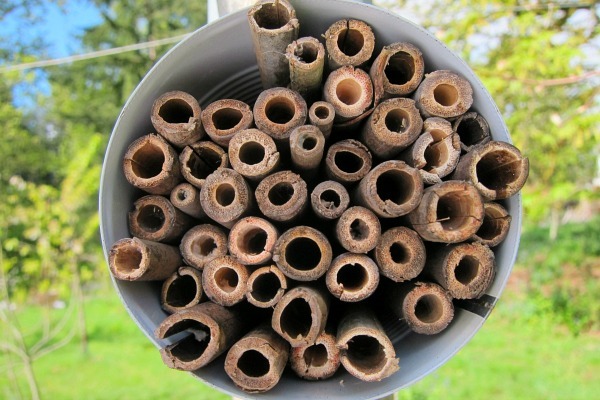 How can I attract the mason bees to my new little homes (when I’ve got them ready)? And should I harvest the cocoons or do something with them? Do I need to clean the tubes ever? I live in the Denver, CO area. What do I need to do to help the bees through the winter, . .. anything? Hi G.E., the good news is the bees find the homes on their own, lay the eggs and seal up the chambers with mud. Done. You don’t have to do anything. I’ve never cleaned the tubes and they seem to come back year after year. I’m not sure about their winter dormancy and what level of cold they can take, but to be on the safe side, maybe just keep them in an unheated garage or shed until spring. Good Luck! Tom, where do you find the bamboo/hollow reeds, please? Hi Deborah, I kept an eye out for wild stands of bamboo, and in one case asked a friend on the island if I could cut some small bamboo shoots from her massive bamboo hedge. If you can’t find any that way, usually bamboo stakes at nurseries and garden centers work well. Thank you, Tom! We’re on it. And thanks for your blog. I’ve enjoyed checking in from time to time. I loved the post about pie and Kate McDermott, some time ago… that’s how long I’ve been hanging around.